Soup season is year-round for us. Mason jars of soup show up in the office fridge on a regular basis, and there is an occasional line for the microwave around noon. We swap soup recipes regularly and experiment with new flavors on the weekends. Bring us a loaf of crusty bread, and we’re set. 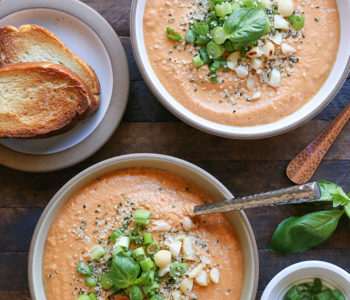 Some would say we are soup obsessed, and it may be true. 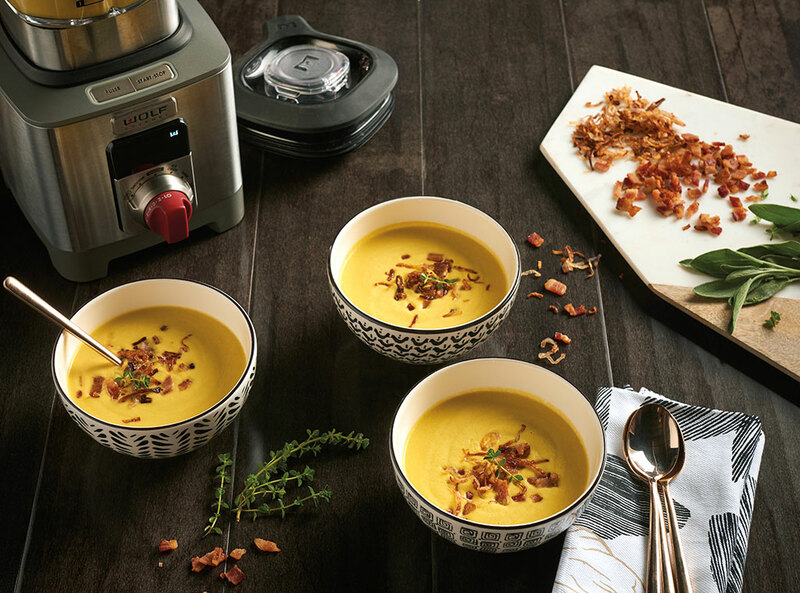 When you can blend and pour a hot soup in six minutes, the possibilities seem endless. Using sautéed or roasted vegetables expands the flavor profiles even further. 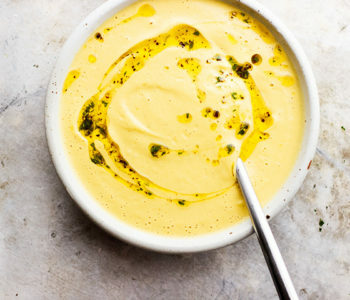 Cooler evenings and the arrival of fall mean soups take on a seasonal turn, bringing back pumpkin as well as potatoes and squash. There are plenty of varieties of squash to choose from to make a satisfying soup for a cool fall day. Butternut squash is one of our favorites. Use a chef’s knife to cut about one inch off both ends. Stand the squash up on the bigger end and carefully cut the skin off, and cut in half lengthwise. Use a spoon to scoop out the seeds and membranes, then cut into pieces. If you are short on time, you can find peeled, precut squash at most grocery stores. 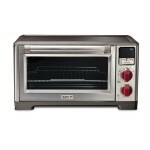 It roasts up nicely, smells wonderful, and can be further enhanced by additions from sweet to savory, both with excellent results. We took the savory route, adding seasonal herbs and bacon into the blender with the roasted squash for a hint of smoky flavor. Hanging out with fellow food enthusiasts, we can geek out over something simple like garnishes. 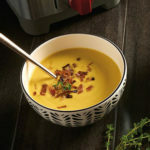 The crispy shallots are definitely worth the effort; they add a textural finish and contrast to the rich, velvety soup. Preheat oven to Roast 400°F. In the baking pan, toss together half of the diced bacon, all of the squash and onion, olive oil and 1 teaspoon kosher salt. Roast until squash is tender, 25-30 minutes. Set aside. Heat a medium skillet over medium heat. Add remaining half of the diced bacon and cook until well-browned and crispy, about 8 minutes. Transfer to a plate lined with paper towels. Set aside. 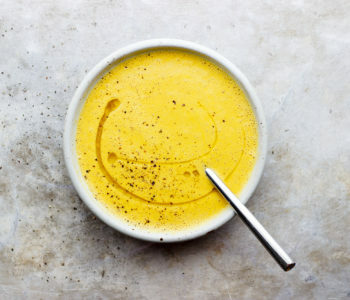 In a small saucepan, heat 1 cup of canola oil over medium-high heat until it registers 275°F on a deep-fry thermometer. Add the shallots and cook until golden brown, about 5 minutes. Transfer the shallots to a plate lined with paper towels. Set aside. Add chicken broth, heavy cream, sage, thyme, remaining ½ teaspoon kosher salt, black pepper and crushed red pepper in the order listed. Add the roasted vegetable mixture. Select Soup setting and press start. Once the cycle finishes, serve immediately with reserved crispy shallots and bacon. 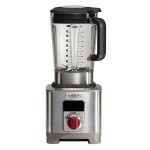 Craft what you crave with the Wolf Gourmet high-performance blender.It offers complete control for complex recipes and pre-programmed settings for one touch smoothies and soups. Infinite speed control and quiet design are just the beginning.